Some people may think that choosing a razor is purely a cosmetic choice, but the truth is that it is farthest from being purely a cosmetic choice. We know how it feels when we have those nicks, cuts, and irritation from the one that isn’t made for you, so a lot of thinking should go in before you decide which razor you want to buy. Open comb razors over the years have been providing quality and efficient shave. A lot of science goes into how razors work and how we should go about choosing the perfect one for any specific skin type and skin needs. 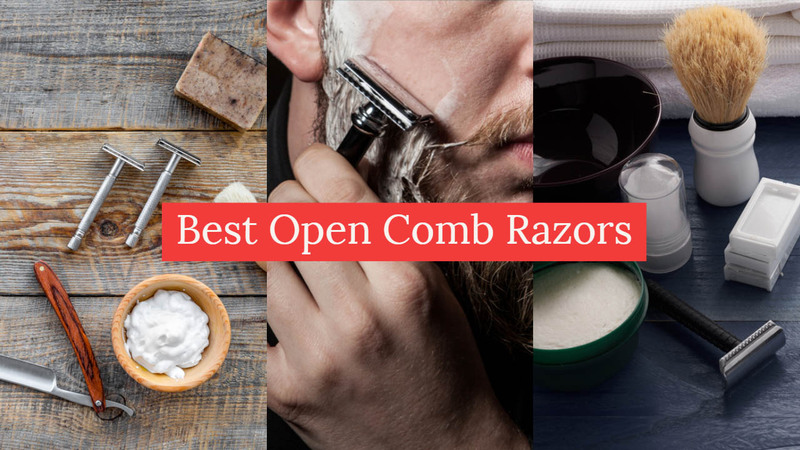 So, to help decide which one to pick, without any further delay let’s dive right into our list of 10 best open comb razors. The first on our list of best open comb razors is Muhle R41. Muhle is a German company and they have been around since 1956 and have produced a variety of really fine razors over the years. The material used in manufacturing R41 is chrome plated die-cast zinc alloy which makes it non-corrosive and long-lasting and gives it a really attractive luster. The standard Muhle R41 weighs about 2.8 ounces, but it has different variations ranging from 1.8 ounces to 3.4 ounces. It has a variety of designs including handles made up of white and black high-grade resins or with chrome-plated brass, so if you are not going to allow build a lot of soap, they are going to last you a while. R41 is a tooth comb razor and razors of this kind were particularly developed for wet shavers and for people who don’t shave as often. The design makes it an aggressive razor because the head does not cover the blade as much as the more popular razors and its specific angle makes it efficient at cutting hair. Some have also said that it’s the most aggressive razor present in the market, so we would recommend you to have some practice before you put your hand on this one, safety first you know! Like closed comb razors, the blade is held in its place by the curvature of its cap. Open tooth comb and a gap behind the foam edges make sure edges are debris free (debris being the shaved hair and other residues including shaving foams and soaps). So, you would like how clean it is after the shave. One of the important things every shaving guy would agree with me is the grip of the razor. R41 has a thicker handle with little grooves on it, which provides a nice grip horizontally, but vertically it does not have the best of grips and you may have trouble if your hands are soapy. As we know, shaving result depends on several factors including how thick the beard is, its density, the length of hair and most importantly how blade and the razor interact with your beard. Some may achieve the desired results with sharp and aggressive blades while others can benefit more from slightly gentle blades. R41 is best if you have thick hair density. If a comparison is to be drawn between Merkur 34c and Muhle R41, it has to a comparison of their design as in term of aggressiveness, length and weight both are pretty much same, however, there is a significant difference in their design. Merkur 34c and Muhle 41 both are three-piece design, which is separable, but the difference is Merkur 34c has a cap containing big screw which tightens the head with bottom very firmly and it almost eradicates the wobbling of the blade but this mechanism is not that efficient in Muhle 41. In conclusion, as described above, it is one of the most aggressive razors present out there. It is most commonly referred as “the beast” as it’s the razor of choice for the people with thick, dense and long hair growth. Toothed foam edge is most desired feature for the people who wish for sport three-day stubble. It can also be a good time saver if you don’t have time to do a 3-to-4-pass shave in the morning, but it is aggressive and can slice you up. For a long time, Parker has produced finest and efficient shaving equipment and grooming accessories for men. 24C is one of their finest productions. It is an open comb three-piece razor. When it comes to the material used, Parker has used a brass frame for the durability of 24C which also gives it an alluring look, but it does not have the best of finishes. This razor has a length of 4 inches, has a gritty metal handle. It weighs around 3.3 ounces which makes its design a heavyweight. Most of its weight is in the handle. Three-piece design of this razor disassembles into separate pieces and makes the blade alignment easy and precise. Tooth-shaped razor design enables the maximum interaction between razor and hair and thus provides a smooth, swift and clean shave. When it comes to grip, 24C has two sets of grooves, a couple near the bottom and a couple near the top, I hold it near the head and the grooves make your fingers stick to them making the grip very tight and having little chance of slipping it out. Because of its design, it doesn’t get clogged by the hair debris and after the shave, its disassembly makes it easier to clean. It is around 4 inches long, so with my larger hands I always like getting something closer to 4 inches long, so Parker 24C can be a great fit for my hands. Parker 24C is good for both beginners and experienced wet shavers as it is neither too aggressive nor it’s too gentle. Razor provides an optimal shave to all individual. 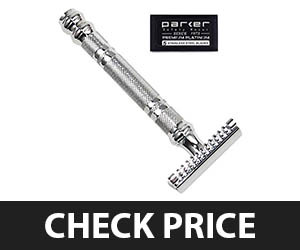 If you are looking for the best open comb razor, it is probably because they are considered more aggressive, Parker 24C is aggressive but I would rate its aggressiveness at 3/5 because there is not much space between the blade and the safety bar, which in turn does not expose blade as much, so if you are new to wet shaving, this can be a good choice for you. In essence, this razor is good for all kind of shaves, so whether you have dense hair or light, long or short, hard or soft, this can be a good choice, but if you have really hard stubble, you may three to four passes to really have an efficient shave. Its ability to be separated into three different pieces enables perfect alignment and easy cleaning. Not suitable for a too dense and hard beard. As far as the comparison goes between Parker 26C and its predecessor 24C goes, there isn’t really much to choose from. The only thing Parker tried to improve upon 24C was the aggressiveness, so 26C is a slightly improved model than 24C when it comes to aggressiveness. 26C may not be a suitable pick for you if you are new to wet shaving and haven’t honed your techniques. Parker 24C, on the other hand, is suitable for beginners as well because of its moderate design. Weight and length are pretty much the same, but there is a slight difference in design. Unlike 24c, 26c has fixed razor design so it can’t be disassembled like 24c. So in terms of blade alignment 24c has the advantage over 26c. Merkur 23C is a German made razor which means you don’t have to worry about its durability. Merkur 23C measures 4 inches in length with a handle of 11 mm in diameter. The material is plated with chrome which provides alluring look. Merkur 23C, just like Parker 24C, can be disassembled into three separate pieces which enable the perfect placement of blade in razor and ensures maximum interaction between hair and blade. Another benefit of this separable design is that its head can be flipped and the edges can be protected making it hard to be worn out. In my view, Merkur 23C is an excellent option for wet shavers. In beginning, you may face difficulty using it but after mastering the technique this little buddy won’t let you down. The handle of this razor is long and knurled which gives its user a firm and steady grip exactly what you need for wet shaving. It’s also available in short handle for people with small hands. Gaps are not present in its razor head which may lead to clogging and you may have to open it up to unclog it. This little difficulty is balanced out by its pretty cheap price. There is another negative point about this razor in that it doesn’t come with blades. It is required for you to purchase the blades separately, but again there is only so much you can get at that price. To sum up, if you’re running short on budget, but require an efficient razor Merkur 23C is the product you’re looking for. If you’re a wet shaver, it is an excellent choice for you. Merkur 33c is also known as Merkur Classic. Razor is pretty simple in design, lightweight and well constructed which is probably why it’s named as Classic. It weighs around 1.75 ounces which is definitely on the lighter side which I personally find a difficulty to work with. Its handle is moderate in length at 3.5 inches. This head-heavy razor has a good balance point located right at the top of grip which gives swift maneuvering. Length is slightly shorter than other Merkur razors which is good for people with smaller hands. Grip has cross-hatch patterns which are well debossed so even with wet or soapy hands it enables a firm and steady grip. Handle also has two grooves which mark the end of the handle. So, on the whole, it has a good grip and it shouldn’t be a problem. Lightweight of the razor makes it relatively less aggressive, so Merkur 33c should be a razor of choice for the people with thin, less dense and short hair growth. For people, in contrast, razor requires force from the user which is not good as a little too much force can cut the skin and we all know how it feels like, don’t we? Like almost every other razor mentioned in the list, it is also separable and can be separated into three pieces which enable good placement of blade. Because of the material used in its construction, it’s pretty durable and should last you a while. In conclusion, this is one of the most budget friendly razors you can get your hands on. Other than that, if your hair growth is less dense it is good option for you. It is an absolute jackpot for people with small hands because of its lightweight and provides steady grip and swift maneuvering. Merkur 33c vs 34c which one is more durable? Merkur 34c weighs around 2.6 ounces which is slightly heavier than Merkur 33c that weighs around 1.7 ounces. Because of its weight, 34c is also called heavy duty razor or HD razor. Length of both razors is pretty much the same. Design of 34c is different and unique as its top cap screws deep into the end of the handle. One major advantage of this design is that if you accidentally drop this razor, the force will be absorbed by the end of the handle or by the bottom of head which makes it more durable than other razors available in the market. Fatip is an Italian company and has been in the business since 1950s. Fatip Grande is a double edge safety razor that doesn’t get talked about much, but after testing this we have realized it has some really great features and deserves to be in our top 10 best open comb razors. Fatip has introduced double edge open comb razor in three different handle designs which are the Grande, Piccolo and Retro, head for all three razors are same and handles can be selected according to one’s desire. Fatip is one of the only few razor heads which are made up from solid brass. Handle is also solid brass but available in a few different plating options like nickel, chrome, gold, and black metal. Grande weighs about 2.2 ounces which is pretty light. Because of its solid brass material, it’s manufactured to last a lifetime. There is a similar feel to handles when it comes to grip. The grooves cut into handle are shallow and are not much to hold onto, which can become slippery if it is wet. 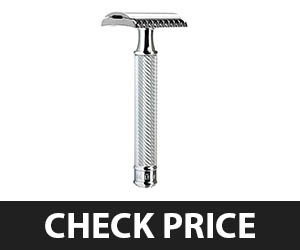 The price of the razor varies according to the finishing design and handle you’re selecting, but don’t worry price of every design is not much and is easily affordable. The open comb allows a clear path for the longer hair to interact with blade and get cut. Other than this design also helps to avoid the clogging of razor. The previous version of this razor head a steeper angle which allowed an aggressive shave, but the revised model has comparatively shorter razor head which allows less exposure of the blade, yet gives an efficient, swift and moderately aggressive shave. With all its good qualities, there are some things which could have been improved like finishing of the product. The finishing of this product is not as it should have been. You will see spots and improper coating on both handle and head which is why its coat may not last very long. It also has a blade alignment problem. The threading on the Fatip head is actually closer to a 10-32 thread pitch, so it is a little bit smaller than average on the market, so occasionally you will run into a handle from another manufacturer that would not fit on the Fatip head, but you can always put a couple of layers of Teflon tape on the threading and you are good to go. In essence, if you’re really into the designs and want your razor to look cool, it is the razor you’re looking for. Different designs are not just for the looks, it also helps in the way that people with smaller hands can choose razor with shorter handle and those with bigger hands can choose the one with longer length. Finishing may not be one of the best around, but its moderate aggressiveness and excellent price point make Fatiq quite a worthy buy. 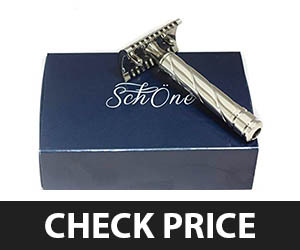 Next on our list of best open comb razors is this Italian made safety razor from Schone. It is hollow-handled, which makes it a much lightweight razor, it weighs around 66 g. Razor is well balanced, simple and easy to use. Handle has pipe detailing on it which has finishing of gold polish making it cool and stylish. Coming to its features, it has a head which open comb, which as we know by now allows the hair to be shaved efficiently. As it is a three-piece razor, it is easier to clean and store. Open comb allows the long hair to interact with blade giving you a smooth shave. Talking about its head, if you see it without the blade it looks good, but once you place the blade inside the head a space is generated which causes blade to wobble and consequently blade doesn’t sit well which means a less efficient shave. The Schone is a lightweight razor, so it can’t be used for aggressive shaves because the handling and maneuvering becomes tricky. This razor is suitable for people with light and less dense hair growth. At around $25, Schone should have come up with a solid handle instead of the hollow pipe, which is really a disappointment. Schone open razor is not really the best of choice for wet shavers as well as its handle doesn’t provide a steady and firm grip. For a razor to provide a steadfast grip, it should have embossing on its handle and although Schone has some embossing (pipe detailing), it is not enough to provide a really comfortable grip. Really, to be honest, there are plenty of options you can avail in the price of this razor, but if you have really soft and less dense hair, then you can benefit from this product. 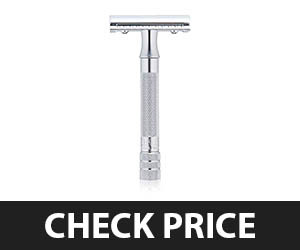 Classic Merkur three-piece double-edge safety razor’s design is long-lasting, easily cleanable, and easy to use. The razor has alluring chromed open comb straight bar head with standard fixed blade gaps. As we know by now, the razors with more wide gaps are believed to be aggressive as they have a high exposure of blade and no matter how long, thick or dense the hair growth is, this bad boy won’t spare it. Handle of this razor is of hexagon shape and has a lined inlay, which provides a great grip. Merkur double edge safety razor gives the best possible close shave without causing irritation otherwise experienced with other open comb razors. 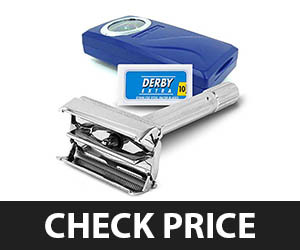 Razor is budget-friendly as it is compatible with cheap and recyclable double edge blades. Always hold the razor at an angle of 30 degrees. Moreover, blade has an open comb which makes it easier to clean and its separable design makes the placement of the blade perfect consequently giving you a smooth and swift shave. Because of the gaps, this razor is less likely to get clogged. In essence, if you would ask me why you should buy this, the answer is why shouldn’t you buy it? It has all the qualities and features that one desires in an open comb razor. The blade gives a smooth shave. Its design prevents you from irritation and most importantly it’s compatible with inexpensive blades available in the market. So, forget about a-dollar shave, this one is going to give you some cents’ shave. We reviewed Parker 24c earlier in our list and although there is not much difference between Parker 24c and 26c, the latter being the latest version has some improvements and features that the former lacked. This three-piece razor weighs around 3.3 ounces and having a heavyweight design makes it one of the best razors for aggressive shaving. Open comb enables the maximum interaction and heavyweight ensures that the hairs are shaved efficiently. Like 24c. 26c is also an open comb razor which provides an extremely close shave. Material used in its construction is solid brass with an exotic black handle. Handle is 4 inches long and is textured for steady grips. The textured handle enables firm handling even when your hands are super wet or super soapy. Moreover, it has a separable design which enables insertion of blade easy and precise and also makes it easier to clean and store. This razor is recommended for both beginner and experienced just like its sister product because of its simple yet efficient design. Handle has detailing on it which is extremely useful and comfortable for wet shaving. This is an excellent razor and a great help especially if you are cutting off a week’s worth of thick beard hair. If you have been a closed-comb razor user, beware to change your angle of attack, otherwise, you will cut yourself as with any other open-comb razor. Throw some feather blades on it and you will have the face of a baby’s bottom. In conclusion, it is a great buy for the price, good for both beginners and experienced and once you pair it with compatible blade you can get barbershop shave at home without paying anything to anyone. We have another Merkur on our list of best open comb razors, Merkur 15c is designed to last a lifetime because it is extremely durable like any other Merkur’s razors. When it comes to looks, Merkur 15c material is finished with chrome giving it an attractive look. Patterns are embossed on its 3-inch long handle which provides a comfortable and steady grip even when your hands are not dry. The design is quite charming and elegant. This razor has a safety bar which has open teeth with gaps which are believed to help with a wiry and very thick beard. This is also a good option for aggressive shavers looking for more aggressive razor than 23c. Moreover, the handle of this razor is pretty thin, but it’s easy to hold despite of that. Its 3-inch length and a non-slip grip make it an excellent option for people with smaller hands who find it difficult to shave with razor having longer handles. The smaller handle enables maximum maneuverability and thus gives a perfect shave. It is head heavy which means that you don’t have to apply much of a force because it does all the work for you. While using this razor don’t push it too hard on the skin like other razors, reduce the hair of the beard gradually and you will get a smooth face you never had before. In conclusion, Merkur 15c should be a razor of choice for people with smaller hands and definitely a jackpot for those who are aggressive shaver, so if you’re any of those don’t wait just go ahead and have this on your list. Shaving Factory double edge safety razor is different and unique in design than all the other razors we have reviewed in our list of best open comb razors because it comes in “twist to open” technology and blade is inserted by loosening a knob as it opens the head of razor. Blade can be adjusted well in this razor also. Moreover, it comes in a wonderful hard plastic travel case with a small mirror inside, which makes this razor great for travels. 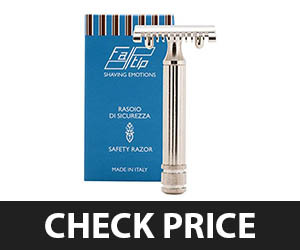 Shaving Factory is compatible with all standard-sized razor blades including stainless steel Derby blades which are not very expensive, so it gives you cheap yet cool and smooth shave. This is a light, but a well-constructed razor. The gates hold tight when closed, but can be a bit lose when open. It comes with a blue gift box which has space for it to be contained plus it has additional space for the blades to be used and as you would expect with a price tag like this razor has that the material used is not that long-lasting and is corrosive. It is not too aggressive and can be a great buy for your travels and if you are a newbie. Essentially, twist-to-open or butterfly technology is enough to make it go on your bucket. It is inseparable, so the chances of its parts getting lost are very less, but the material used is corrosive and finishing is not the greatest you are going to see. There are many open comb razors out there each of them having their own cons and pros. Some of the best razors made it to our list. Up till now, we hope that you have made your choice and you have also realized that razors aren’t like just any other product and you need to put a little bit of thinking before purchasing them. 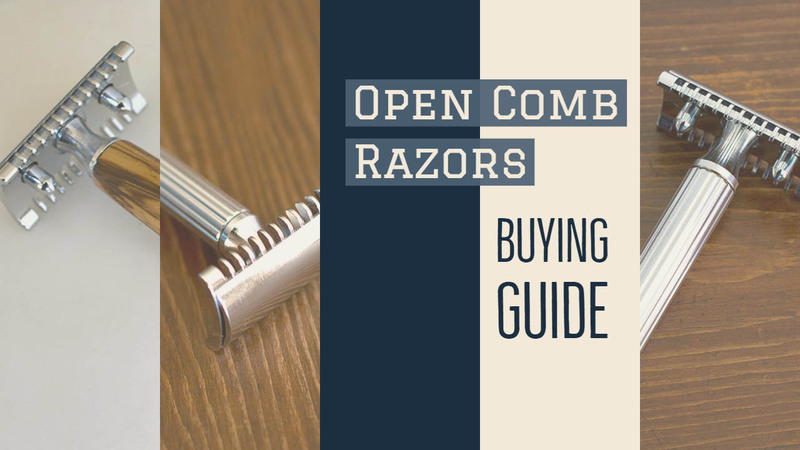 But if you’re still confused about the razor and not sure which one is best for you here is the ultimate guide for you to choose the one you desire. Generally, there are two types of sizes available on the market one is 3 inches and other being the 4 inches. The difference between two is just of one inch and it may not seem very important while purchasing razor but there is a lot to that different than just one inch. Not the hands of every other person are of the same size some have bigger hands and some, on the contrary, have smaller hands. So, 4-inch handle is not good for people with smaller hands and similarly, 3-inch handle is not suitable for people with bigger hands. Incorrect size of the handle will cause hindrance in proper maneuvering and thus not giving you the shave you need. In fact, you may cut your skin instead. So the people with bigger hands should choose the handle of a bigger size and similarly, people with smaller hands should use the handle of smaller size. Weight of razor is important as the size of the razor. Razors with heavyweights are more aggressive and are used for the hair that are dense and hard however the razors with light weight are less aggressive and are used for less dense and light hair growth. The choice is very important if a person with dense hair uses a lightweight razor it will provide him no good. In fact, it may cause great distress as the person would need to push hard and would need to force the razor which may cut his skin. On the other side if a person with light and less dense hair growth will use a heavyweight razor it will not cause him anything but harm. He may end up cutting his skin instead of shaving his beard. So it’s important to decide the appropriate weight of razors and for that, it is important to know about the hair of your beard. If the beard is dense and hard go purchase heavyweight razors and if it is light and less dense than go purchase a razor with lightweight. Well the reason why most people purchase the razors may be the time. As you may have to wait at the barbershop to get your turn but you can do it without wasting your time at home. So people purchase the razors to save the time but there is another reason why some people purchase razors which is budget. It is not economical to go to a barber and have a shave every day. So people purchase the razor to get an economical shave at home but what if you purchase a razor which is not compatible with inexpensive double edge blades available in the market? Too bad isn’t it? So to help you with this we have mentioned in every review if the razor is compatible with inexpensive blades available. 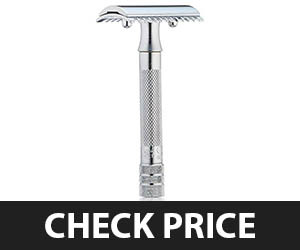 If you are running low on budget, then don’t purchase the razor without checking out this feature. There are two basic designs of open comb safety razors one is three-piece or two-piece separable design and other is single-piece or inseparable design. Now, both of these designs have their own pros and cons. Separable three-piece designs enable the efficient placing of the blade in the head of the razor and it also enables the easy cleaning of the razor. This design has a disadvantage that is when the razor is opened and the blade is placed in the head sometimes the head is not closed properly which causes the blade to wobble consequently causing discomfort to the user. While some major brands have worked on these issues and have resolved it to a very extent still there are many brands out there which lack this improvement. 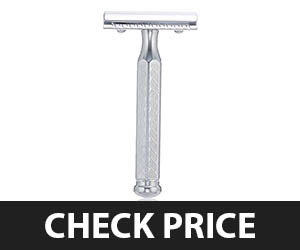 So before buying the razor do check it out it is mentioned in our reviews stated above. 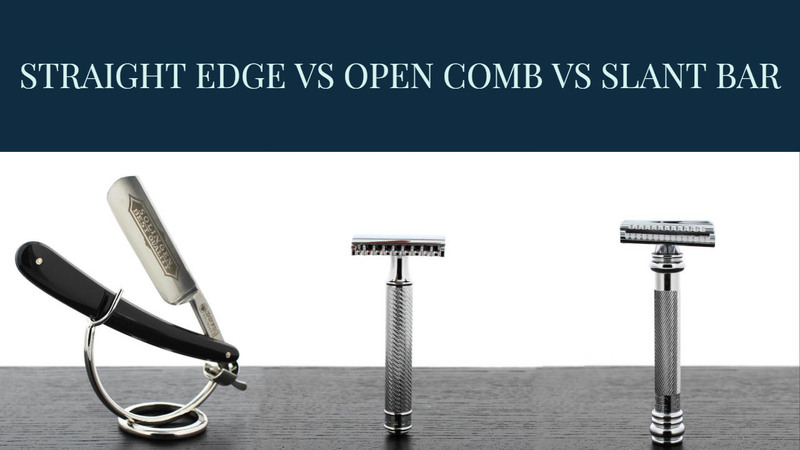 Now it may be in your head that what is the difference between an open and closed comb and how it affects your shave here is what you need to know. When razor has an open comb it means it has the gaps which allow a greater amount of exposure of blade and subsequently helps shaving of long hair. As because of gaps now there is greater interaction between blade and hair. 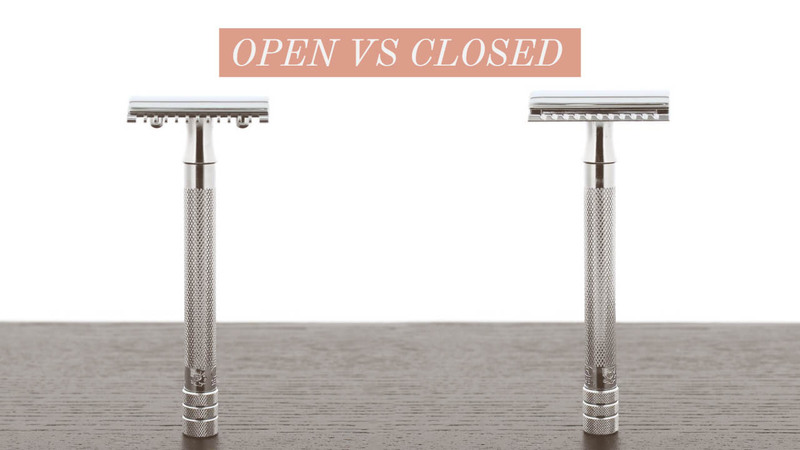 In General Open comb razors are more aggressive than closed comb which is why people with hard and dense hair should use an open comb and those with a light beard should use a closed comb. Grip of handle is very important for steady grip and proper maneuvering. Grip is made comfortable by using the appropriate design and appropriate embossing on the handle. Some brands use a fairly simple design on their handle which is less embossed while others use extensive embossing and make different patterns. Handle with the former design doesn’t provide a very firm and steady grip as the palm of the hand is too smooth and it requires some sort of pattern of embossing to hold on to. On the other hand handle with patterns provide fine grip and even when your hands are wet or soapy the safety razor won’t slip away from your hand easily. This is another factor you need to keep into account while purchasing a razor. If you want your open comb razor to last long material from which razor is constructed must be kept in the account. Razor is something that has to be in contact with water every time. So if the material is not stainless or non-corrosive it is not going to last very long. The finishing material and finishing quality is also important as the material used. Improper finishing allows the air and other materials to come in contact with construction material and render it useless. So if you’re concerned about the durability of product you should not overlook this. Overall, all the German and Italian product have the finest material used in their construction. Design of open comb and slant bar is not much different. Open combs because of a toothed safety bar provide a greater exposure of blade which makes them more aggressive and best for irregular and dense hair growth. Slant bar, on the other hand, is designed for men with sensitive skin. It cuts the hair from a certain angle which makes a clean cut on the follicle and reduces the pulling of follicle during the process. Straight edge, on the other hand, is an entirely different category in term of its design. Its blade can be folded in the handle. Unlike the former two, this type of razor has a single edge blade with a greater length. Straight edges are usually used for extremely dense hair growth and as it is hard to maintain a proper grip on them, they are not very easy to use. On the plus side, the possibility of a straight edge being clogged is almost next to nothing because of their design which also makes it easy to clean them. 1. Does the size of razor’s handle matter? Yes, it does matter. In fact, it is pretty significant. People with smaller hands should use the handle of a smaller size and those with bigger hands should use the handle with a bigger size. 2. What makes a razor more aggressive? In general it is thought that weight of razor makes it aggressive or less aggressive. Heavier the weigh more aggressive razor is and those with light weight are less aggressive. 3. Should people with dense hair use razors that are more aggressive? Yes people with dense hair should use more aggressive razors as the weight of razor will help them in shaving the dense and hard hair growth. 4. What kind of razors are more durable? 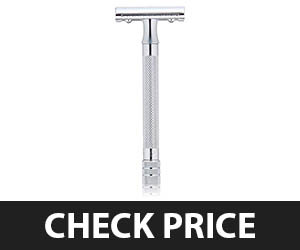 Razors that are made up from brass and coated with chrome are most durable razors. However, almost all the German products are constructed to last you a while. 5. Open comb razor or closed comb razor which one is better? Both have their own pros and cons and it generally depends on what sort of hair growth you’re using them on. Open comb safety razors work well on dense and long hair while closed comb works just fine on less dense and short hair. We hope we have eliminated a lot your confusions and have helped you decide the razor you want to buy. If there is anything you would like to add or suggest you are welcome to do so in the comment section below.